I’m so sorry, but we’re going to have relive the Avengers: Infinity War ending again. Especially because it has something to do with how we’re moving forward in Avengers: Endgame, including what was taken out of the 2019 sequel. Wipe that dust (I hope that’s dust) from your eyes, grab a box of tissues, and find out why Infinity War’s heartbreaking final moments were originally not even in the movie at all. If you’re one of the five people not to have seen the movie yet then spoilers follow. 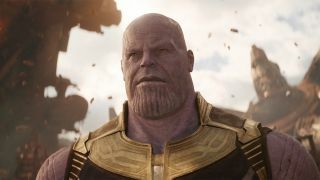 With a snap of his fingers, Thanos rid the universe of half of its popularity and sent us into fits of wild sobbing. Spidey, Star-Lord, Black Panther: all gone. However, we were meant to see all of that (presumably) in Avengers 4, as writers Christopher Markus and Stephen McFeely explain to the New York Times. That also sets up the sequel as a perfect follow-up to the “tragic ending”, as Markus puts it, of Infinity War. If the snap came in Avengers 4 then you’re probably getting deaths and, in all likelihood, resurrections within the space of two hours. There’s no stakes there. We now have stakes. Lots and lots of them. And one helluva long wait. It’s official, we’re in the dark timeline. At least you can brush up on how Avengers 4 will start the MCU up all over again.